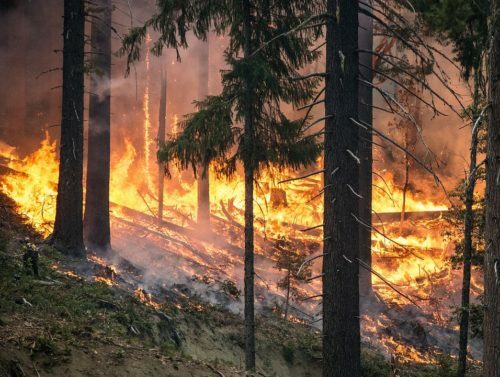 From the Klamathon Fire shutting down Interstate 5 at the Oregon border to the Ferguson Fire threatening Yosemite, fire season is in full swing in the western states. For both farmers and local emergency planners, including agriculture and livestock into preparations can be daunting, but WIFSS has outreach for both audiences. Related to emergency preparedness on the farm or ranch, WIFSS offers a selection of on-line resources, but this summer perhaps the most relevant is a Saving the Ranch. This 30-minute video describes in detail how livestock owners can prepare their rural property to assist fire service response, everything from evacuation to sheltering in place, from property access to defensible space. Emergency managers tasked with incorporating animals into disaster response plans face an even more complex task, balancing limited resources to meet the unique needs of pet and livestock owners. The response plans, equipment and expertise required are understandably different for different for flood vs. fire, poultry vs. cattle. Unique situations such as eradicating foreign animal disease or investigating a deliberate threat to the food supply will involve an unusual multi-agency response. In an ongoing partnership with the Department of Homeland Security, WIFSS has trained a diverse group of professionals who can assist emergency managers in developing solutions to local emergency responses involving animals. The most recent of these trainings took place from July 10 to 13 in Burlington and Kelso, Washington, and spanned the breadth of two distinct courses on disaster preparedness: Awareness and Management. The awareness course (AWR 328) is an introductory course that provides students with the tools needed to address a wide variety of disasters involving animals in a rural community. This “blended” utilizes a preliminary on-line training covering the basics for critical capabilities such as animal handling, evacuation, sheltering and mortality management. The instructor-lead in-person follow up focuses heavily on the use of videos, case-histories and table-top exercises to reinforce what participants learned on-line. The management course (MGT 448) provides the information needed to lead a multi-agency team of emergency planners to build a comprehensive emergency response plan involving animals and agriculture. Again using videos, case-histories and table-top exercises the course bringing a variety of local/county 1st responders together to explore solutions to complicated emergency responses. In both Kelso and Burlington Mike Payne and Tracey Stevens of WIFSS shared their years of experience in disaster planning with a multidisciplinary group of students including county emergency planners, fire service, veterinary students and faculty, animal industry professionals.